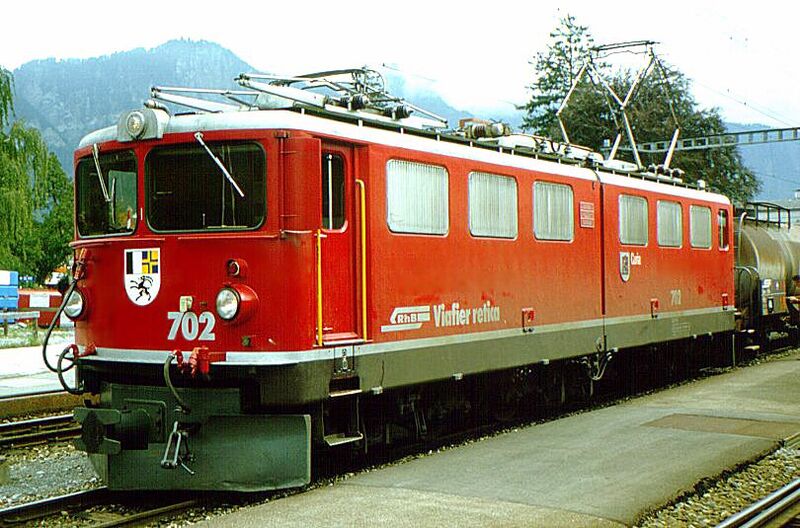 The first units of this powerful locomotive were ordered by RhB in the 50ies of the past century. Many components of these locomotives that feature an articulated body have been derived from the Ge 4/4 I. The first two prototypes were delivered in 1958. Five locomotives followed in 1965 with a slightly different front-section and w/o front door. The front doors of the prototype locomotives were permanently closed in 1968/69. Today the front of all locomotives look similar. As from 1985, RhB began to replace the green livery by the actual red design. The old phantographs were replaced by single leg pantographs in 1998. For many years these locomotives were mainly used to haul heavy express trains on the Albula line. Today the modern power converter locomotives class Ge 4/4 III have replaced the Ge 6/6 II in these services.